Welcome Alys Beach, a small town in Panama City, with much to offer! Getaway to the vacation of a lifetime when you come here. 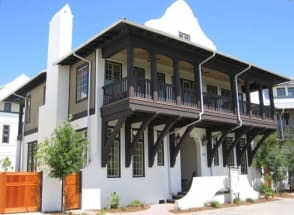 Enjoy a fine meal at one of our local restaurants like George's At Alys Beach for some upscale food in a nice dining room or on an outdoor porch. Also enjoy Caliza, a local 4.6 star restaurant. Feel free to spend some of your stay at local attractions such as boat tours, fishing on the coast, or golfing at a nearby course! Don't want to spend your day jam packed with activities Chill out and cool off by the beach, sit back and relax in your lounge chair, sip a margarita or too even if you please. When you get ahold of these extraordinary beaches and bright blue skies, you won't ever want to leave. When the afternoon rolls around a little after dinner, you can enjoy the sunset of a lifetime. Watch the luminous scenery unfold before you, and take it all in. Alys Beach is the place to be, and if you book with us, I'm sure you'll love your stay. Emerald Coast by Owner is pleased to bring you the best Vacation Rental Properties by Owner in Alys Beach and more! Browse our listings and book online today! When you book with Emerald Coast by Owner, we make it easy for you to choose where, when, and what you want to do on your trip. Contact us with any questions and be sure to book online today!